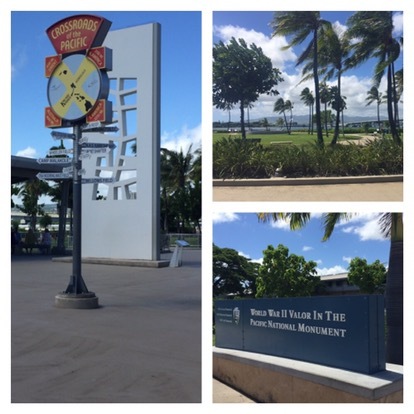 We purchased tickets online to see Pearl Harbor and got there with a little under two hours to explore before taking the boat out to the memorial honoring the USS Arizona. The memorial park had some amazing exhibits and I was glad to have the individual audio-headphone tour to truly understand all that I was seeing. I was surprised at how small the torpedoes were considering the damage they inflicted. I found the film they showed us fascinating and powerful in its timeline retelling of the events of Dec 7, 1941, the day that FDR said, “would live in infamy.” The film footage taken from the actual day brought us as close as possible to the destruction that sunk four US battleships and damaged eight more, destroyed 188 US airplanes, injured over 1,100 men and women and killed over 2400 Americans. The history of the surprise attack waged by the Japanese was interesting and well documented, and my heart went out to the radar operator who saw the Japanese planes approaching, but assumed (with urging from his superior) that the planes were US test planes coming in from California. The Japanese plan of attack was so perfectly executed- the US didn’t stand a chance. 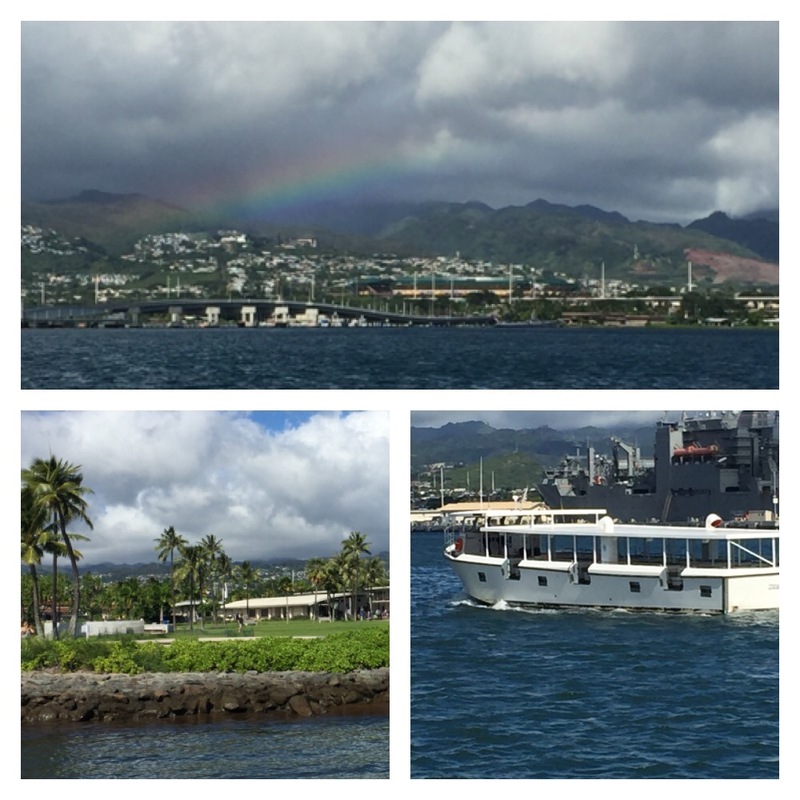 The boat ride out to the memorial was a gorgeous ride, as Pearl Harbor is lined by dormant volcanos that seem to continuously boast rainbows. If you go- try to get on the starboard side going out to truly have the most uninhibited view. 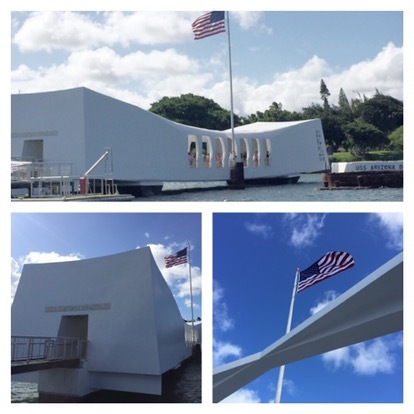 Once we stepped onto the memorial we were able to see parts of the USS Arizona that jut out of the water. We also paid tribute to the wall of names of those who lost their lives. 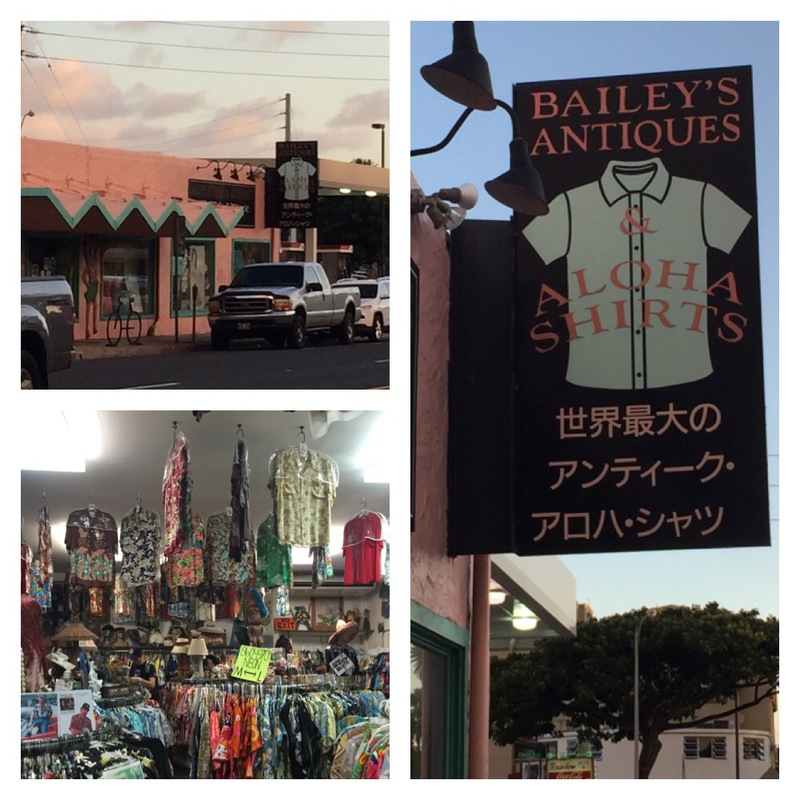 Our next adventure was to find “Bailey’s” Hawaiian shirt shop. One of my co-workers, Dave, a fellow Oglethorpe alum, told me I had to check the place out. He must have a good sense of who I am- because it was my favorite shop in Oahu! It was home to 15,000 different Hawaiian Aloha shirts- the largest selection in the world! There were used, new, and vintage shirts- definitely something for EVERYONE- even sports fans and card sharks! The tops of each rack had all sorts of vintage Hawaiian stuff- lamps, hats, jewelry, old toys, and hula girl statues. Signed photos of Tom Seleck were hanging all around. I could have spent hours in this place, but we only arrived 40 minutes before closing… We left with some souvenir shirts we can wear back home, when enjoying Mai Tais in Hotlanta! 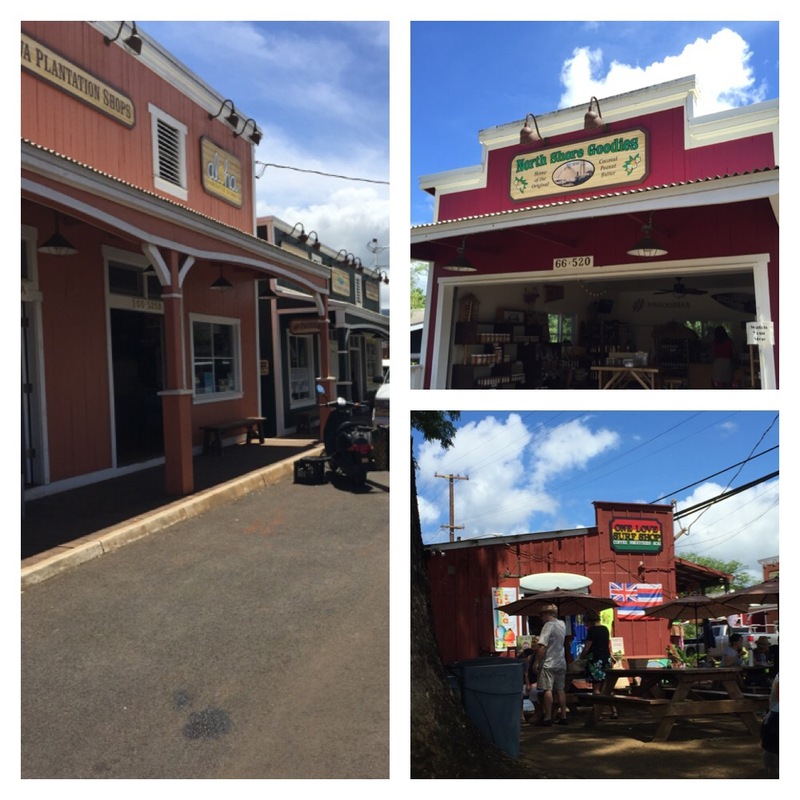 Our last Oahu adventure was to spend a self-paced jeep day touring the North End of the island. What a totally different vibe from the hustle and bustle of Honolulu! We started out driving up the center of the island and past the Dole pineapple plantation. We could see the gardens and the train that takes visitors on a tour, but we opted not to stop. We had to return to Waikiki for a 6:00pm luau! 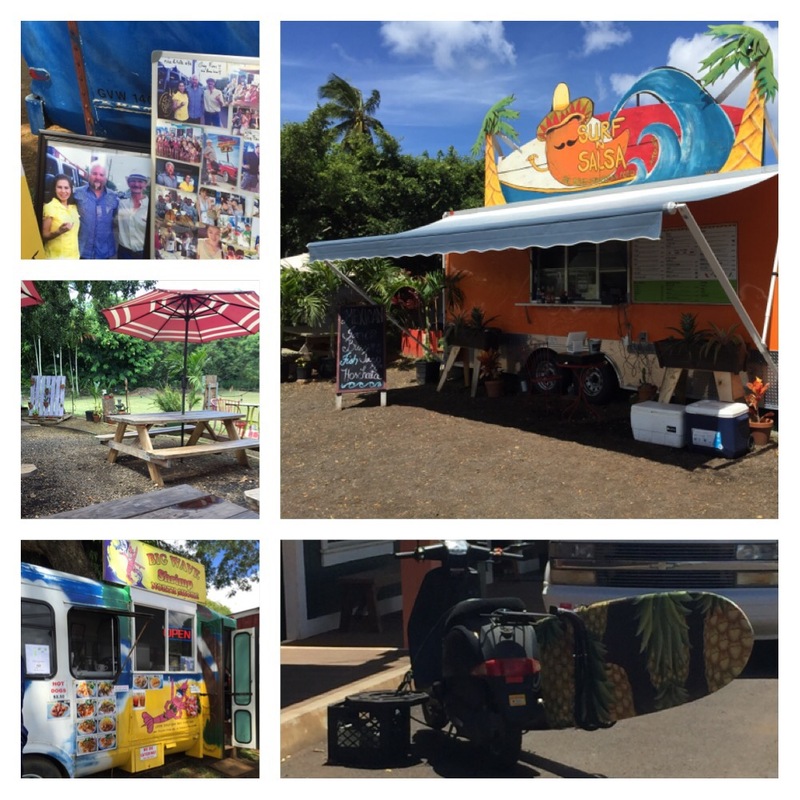 Our first stop was lunch at a renowned “food truck” area off of Haleiwa Beach. These food trucks were visited by “Diners, Drive-ins, and Dives” on the Food Network , and included the Big Wave Shrimp, the Surf Salsa, and a Korean BBQ. We ate outside at picnic tables and enjoyed shrimp burritos and salsa that was CRAZY hot. After lunch we wandered down the street and enjoyed a tasting opportunity at a local place specializing in Hawaiian spreads. Had to bring home a jar of the chocolate peanut butter with macadamian nuts… Wow! 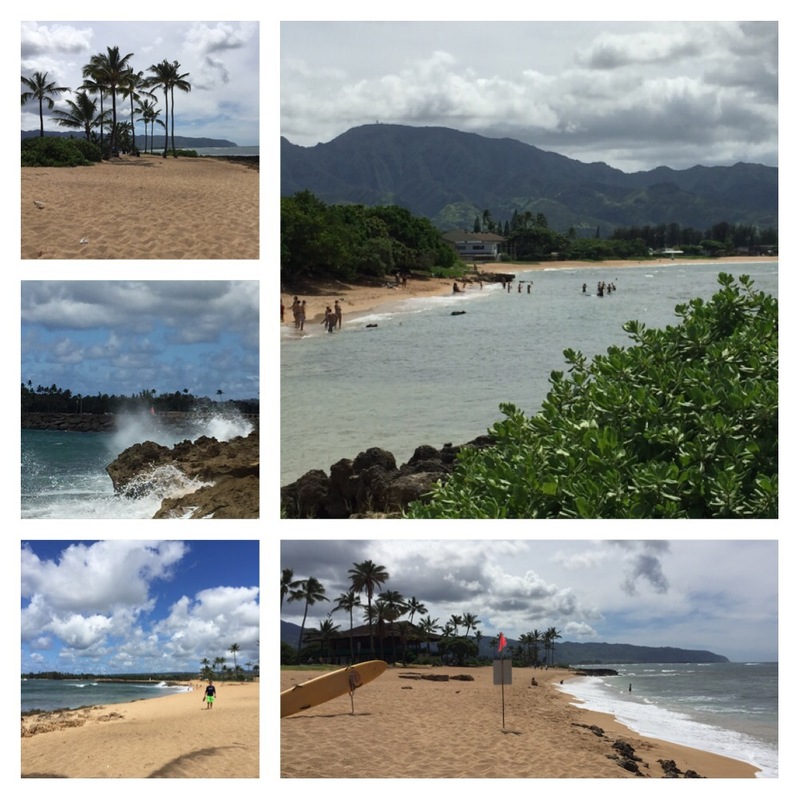 The next stop was to the public area of Haleiwa Beach, where we got to watch surfers take on the north shore waves, and put our feet in the sand. Lots of local teenagers were here, watching the surfers- who ignored the “No Swimming” signs. Perhaps surfing and swimming are two distinct activities? All I know, is that if I were the mother of these young surfers, I’d be freaking out! We continued to drive around the tip of the North End, stopping frequently to ooh and ahh at the scenery. 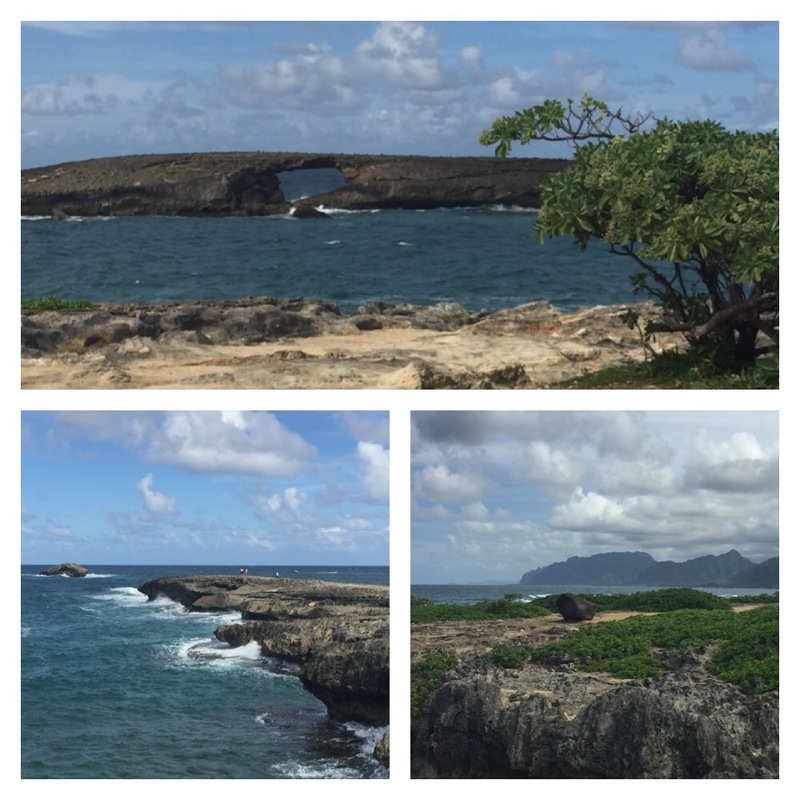 The final stop before returning for the Luau was a place called Laie Point State Wayside Park. This park is literally at the dead end of a residential neighborhood. Surprisingly, the park was sparsely populated with tourists, and when we stepped out of the car to look at the view we couldn’t believe it! The rock formations, actually called islands to the locals, were incredibly beautiful. The largest of the rocks is called Lizard Island, and it’s beautiful arc had a hole ripped through from a 1946 tsunami. Legend has it, according to inscriptions at the park, that this area of the sea was protected by a giant lizard named Laniloa. One day, the lizard had to fight the great warrior Hana. The lizard lost the battle and Hana chopped the lizard into five pieces. Those lizard parts now make up the five islands that we could see from the park. Between the waves crashing against the cliffs of lava rock, and the awe-inspiring views of the rock formations, this stop was one of my favorites. 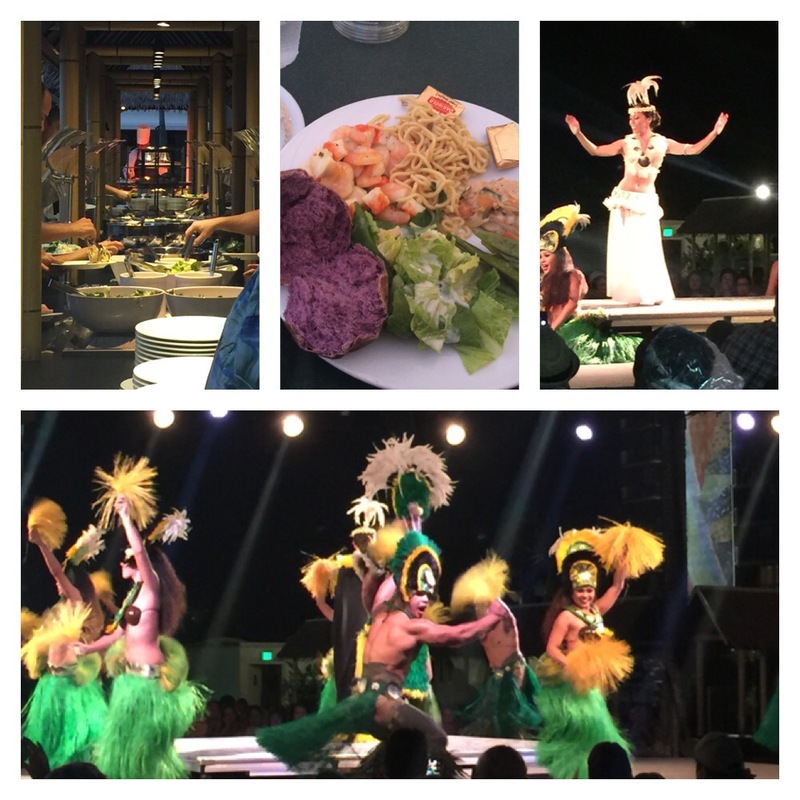 Our last evening in Oahu ended with a traditional Luau and Hawaiian show tracing the history of the Polynesain culture. The show was atop the roof of the Hilton! The selection of traditional dishes was amazing- my favorites were the noodle salad, the Mahimahi, and the shrimp and scallop salad. The entertainment was great- the host had a voice like Frank Sinatra, and the dancers were high energy! The finale fire throwing was fantastic! ​ ​While our time in Oahu is up, I cannot wait to see what adventure and beauty Maui holds!